“Not burnished, burnt,” said Louise in the middle of a conversation. Louise grabbed my attention by sharing a fascinating snippet from when she was a teenager. Her mother had taken her to a dressmaker somewhere in Hull to have a bespoke summer dress made. “I was 13 in 1961,” she says, “so it would have been some time between 1960 and, say, 1962. “The dress was burnt orange textured cotton, with a high boat neck in the front and a shallow V back. It was princess line, which has always suited me and I probably wore it for 2 summers. My eyes focused into middle distance, looking at the imaginary dress as if it were a Disney animation. A late 1960s Marimekko dress using the post-psychedelic colourway of purple, brown and orange. Carried through to the 1970s, the palette was found in interior design, textiles. film and TV design also. In many ways, browns and oranges were the defining colours of the 70s. Louise’s memory was delightful and from an innocent time before she was inspired to make clothes but the conversation was also important for other reasons. It was a direct link to the Hull dressmaking industry carried out at home. Until the 1970s there was a covert and overt dressmaking industry in Hull. The more famous of the industries was Madame Clapham, residing in Kingston Square opposite the New Theatre but there was also a workforce of Hull women who had acquired skills through formal training, apprenticeships or by a combination of both. The numbers of women listed in trade directories under the heading ‘dressmakers’ is testimony to how prolific the skills were. They were in demand and used by women from all walks of life. It was a flourishing and well recognised industry carried out overtly in shops but also covertly in their own homes. Couturiers like Madame Clapham and later on department stores like Thornton Varley or smaller shops like Willis on Carr Lane, employed dressmakers, alteration hands and tailoresses to serve their customers’ requirements. It was common and not the exception to choose to have outfits made by a dressmaker working from home. “Kitchen Sink” describes the activities of dress alteration, making and design that were produced in this way. Traditional dressmaking skills were also acquired there, passed down from generation to generation and although men were not exempt from becoming sewists or tailors, dressmaking was an economy driven by women and girls. It may have surprised you to learn that Louise’s mum had a dress made for her in this way, a luxury even, but before mass production it was very much the norm. It provided the client with a ready made outfit created to their own design that fitted their measurements made by someone who had the skills for a perfect finish also. The latter was an attraction that shouldn’t be underestimated. It was a popular ‘moan’ of that time that shop bought clothing didn’t fit or wasn’t quite what was wanted. Many women who did buy in department stores or local fashion houses had to have their clothes altered before they could be worn. To choose the kitchen sink rather than department store cut out the middle bit – it meant from the first consultation you knew you were getting an outfit or item that fitted, was to your taste and was finished in a way that meant it would last more than one season. It was design-effective and cost-effective too. Dressmakers would work either from paper patterns or create ones of their own. 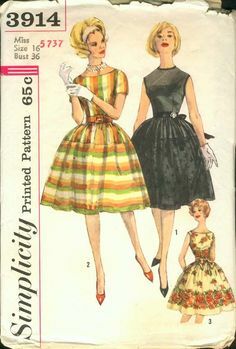 Paper patterns would be brought to them by the person commissioning an outfit or the dressmaker had a collection they would work from. Often they had been used and used again and some dressmakers had a distinct ‘look’ that can be traced back to the base blocks from their most familiar patterns. Wedding dresses made by the same dressmaker, for instance, would often have a similar base but were made unique by changes of fabric, embellishment or length. Hull had thriving drapery and haberdashery businesses – the larger department stores sold fabrics and shops like Buckleys on Carr Lane too. Hull’s proximity to Europe as a port brought easy links to the textiles from the East as well as home grown wool. Many people have talked of being able to buy any fabric you needed in Hull and that sewing skills were ones you either had yourself and used, or could easily find someone to do for you. Dressmakers had the skills to make alterations to those patterns; what we know today as creating a a block, a toile or grading to fit and used sewing machines but also finished by hand. It was the hand sewing skills that set the clothing made by dressmakers apart from the rest. In the pause after mentioning it, she confided that she didn’t think much about the efforts of the contestants. There was another pause after which I asked her why she thought that? Her reply: “I think some of them look home made,” spoke not only to her skills but also the expectation of a dressmaker or tailoress working then. “They don’t have the time,” she added,”you have to have the time,” she explained. Running the shop “Flounces” in the 1980s she found it preferable and easier to create and make bespoke clothing than solely sell those from a manufacturer’s design. Over the time we’ve known each other she’s sketched out more Disney animations, including a particularly striking one – a pink dress with laces up the arms which she designed and made for a customer. And what of the burnt orange dress? I hastily sketched my idea and emailed it to her and was delighted to hear that I wasn’t too far off the mark. “You’ve got the dress almost exactly right, except that the sleeves were what I call ‘long short sleeves, – shorter than just above the elbow, but longer than most modern T Shirts. “And the texture of the fabric was sort of like bark – a bit like a very heavy Dupion without the lumpy bits (slubs?) or an unevenly woven Ottoman. “But of course it was only a cotton, so not really a stiff fabric. And of course it was somewhat shorter than you have drawn it – before mini skirts, but I was only a child, so didn’t ever wear skirts below the knee. Want to see what it really looked like?